Juan Donso Cortés portrayed with his orders and decorations. ↑ Botti, Alfonso (2006). 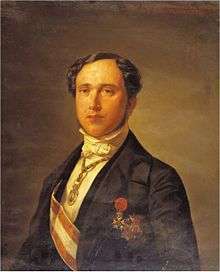 "Donoso Cortés, Juan (1809–1853)." In: Encyclopedia of Modern Christian Politics. Westport: Greenwood Press, p. 176. ↑ Neill, Thomas Patrick (1951). "Donoso Cortés." In: They Lived the Faith; Great Lay Leaders of Modern Times. Milwaukee: The Bruce Publishing Company, p. 244. ↑ Verdeguer, Suárez (1989). "Los Comienzos Parlamentarios de Donoso Cortés", Revista de Estudios Políticos, No. 65, pp. 7–34. ↑ Acedo Castilla, José Francisco (1956). Donoso Cortés y la Revolución del 1848. Sevilla: Sección de Crónicas y Publicaciones del Excmo. Ateneo de Sevilla. ↑ "Church and State," The Catholic World, Vol. V, No. 25, 1867, pp. 1–14. ↑ McNamara, Vincent J. (1995). "Comments on Carl Schmitt and Juan Donoso Cortes," Modern Age, Vol. 37, No. 2, pp. 182–185. ↑ Ulmen, Gary (2002). "Carl Schmitt and Donoso Cortes," Telos, No. 125, pp. 69–79. ↑ Schmitt, Carl (2005). Political Theology: Four Chapters on the Concept of Sovereignty. University of Chicago Press. pp. 51–66. ISBN 0-226-73889-2. ↑ Quoted by Jean Joseph Gaume, Paganism in Education. London: Charles Dolman, 1852, p. 206. 1 2 Essays on Catholicism, Liberalism and Socialism, Considered in their Fundamental Principles, tr. William McDonald. Dublin: M.H. Gill & Son, 1879. This article incorporates text from a publication now in the public domain: Herbermann, Charles, ed. (1913). "Juan Francesco Maria de la Saludad Donoso Cortés". Catholic Encyclopedia. New York: Robert Appleton.